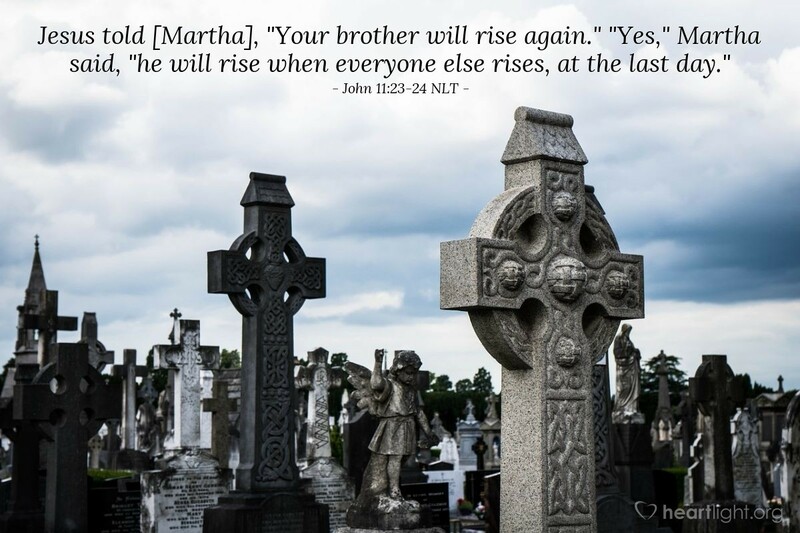 Jesus told [Martha], "Your brother will rise again." "Yes," Martha said, "he will rise when everyone else rises, at the last day." For everyone who dies before Jesus returns, there is the ultimate resurrection day. That will also be the day when Jesus comes in his heavenly glory and reveals the kingdom of God. For Christians, it will be a day of joy, victory, celebration, and glory. It is a day to cherish and anticipate, not a day to fear. It will be our day when our faith in the Lord will be shown to be true. It will be Jesus' day when all peoples of the earth will bow their knees and proclaim that he is Lord. It will be the Father's day because he will bring all of his earthly children home to himself. It will be the Spirit's day, as he raises us back to life and brings us into the full glory that is ours as children of God. However, Jesus decides to give Martha, Mary, and us a glimpse of that day when he raises Lazarus! Ah, won't that resurrection day be sweet! Father, thank you for giving me something that I can anticipate no matter what is going on in my life. I pray for the repentance and salvation of several people who are close to me and confess to you that their situation is my only reluctance in asking for Jesus' swift return and the glorious reunion of resurrection day! In Jesus' name. Amen.